"This isn't just old-fashioned; in 2017, it's unacceptable," said the B.C. premier on social media. Christy Clark said her government will take action to prohibit employers from forcing staff to wear high heels. B.C. Premier Christy Clark says it is "unacceptable" that some women are required to wear high heels at work and that the province will end the practice. Clark took to Twitter and Facebook to say she agrees with Green Party Leader Andrew Weaver, who introduced a bill March 8 to amend the Workers Compensation Act so safety standards, including for footwear, must be the same for all genders. "In some workplaces in B.C., women are still required to wear high heels on the job. This isn't just old-fashioned; in 2017, it's unacceptable," said Clark in a Facebook post March 12. "Women shouldn't have to wear high heels at work. We'll move to end this," Clark also tweeted. Weaver, who is also the member of the legislature for Oak Bay-Gordon Head, took to Twitter to thank Clark for supporting his effort to prohibit employers from forcing staff to wear high heels. "This is a human rights issue. I didn't think people could do this in 2017," Weaver told CBC News last week. "We do have in the Workers Compensation Act some footwear requirements. What I did was bring in the bill that would make it illegal for an employer to require footwear to be different depending on your gender, gender expression or gender identity." It's unclear whether Clark will back Weaver's bill or bring in separate legislation. She told a news conference Monday that her government is looking at the "quickest and simplest" way to implement the change. Weaver said he isn't aware of similar legislation anywhere else in the world, but noted that the issue was recently discussed by politicians in the United Kingdom. 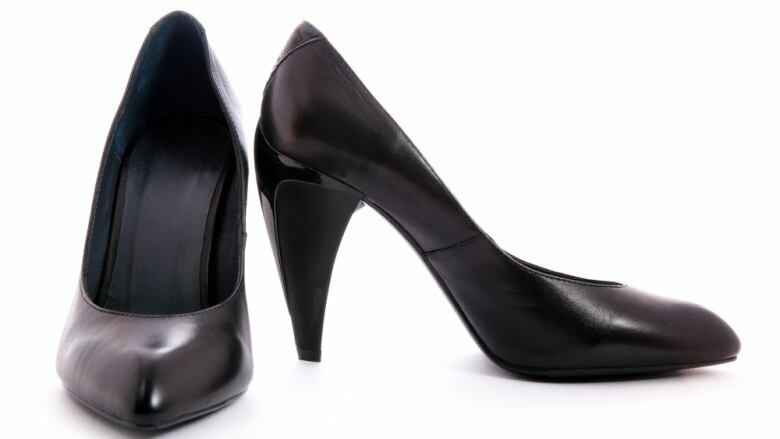 MPs there debated a ban last week on mandatory workplace high heels in response to a petition started by a receptionist who was sent home without pay for wearing flat shoes. The debate was non-binding, but the government promised to act against heel-height rules, makeup guidelines and other corporate codes that apply to women but not men. Nicola Thorp was told in December 2015 that her flat shoes were unacceptable for a temporary assignment with London finance firm PwC. Her employment agency, Portico, had a dress code specifying that female workers must wear non-opaque tights, have hair with "no visible roots," wear "regularly reapplied" makeup — and appear in shoes with a heel between five and 10 centimetres high. Thorp started an online petition, calling formal workplace dress codes "outdated and sexist." It gathered more than 150,000 signatures, making it eligible for a debate in Parliament.